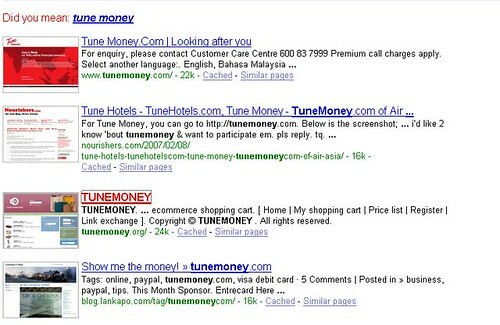 First of all, I would like to thanks all of my reader since my blog is no 4 in Google search page for theÂ keyword “tunemoney”. That is after Tunemoney.com itself. ðŸ™‚ As my friend always mention, “What you give you will get back”. Back to my mission to cash out my paypal account, as mention here. I called Tunemoney.com several time using my handphone at 600 83 7999, but failed. I even email to them since nobody call me for my application status. The line is through. After a few standard procedure question for verification, my card is already at POS office Tesco Shah Alam. The best thing was, tunemoney.com will NOT call you to pick up the card. Just go the appointed POS office after 7 working days. So my advice, just call Tunemoney.com first to make sure. Rather blindly asking the counter, and your card is still not available. Wasting time and money, right?. Tunecard is still new since my number is 140,and the first person to pick up at POS office Tesco Shah Alam.Even the lady at the counter still got to be assist by her supervisor. Just bring your IC, sign a few documents and pay RM 3 to them.That’s all. After that sign at the back of the card, and activate it. Ok, There is two things here. 1st, your pin number will be mail to you within 7 days after you activate your card. This pin number is actually for your ATM withdrawal. 2nd, your password ? I don’t understand, If for login to Tunemoney.com. The password is the one that you create when apply for the card. i have collected my card but untill now i have didn’t receive my pin number. Pls send via e-mail. The card i already activate. Its normal the pin is a bit late. If you still not receive within 2 weeks please contact them. HOW TO APPLY TUNEMONEY CARD???? thank’s for your good information about the tune money. i just apply the tune money two days ago and i really need all the information about the tune money card which the tune money website not provide much. i’m wondering why u done better than them. just kidding Joey,,welcome to my blog..wow how do u find me here and heard about tune card? I dont think I have theÂ local number, have u tried calling them using your fixed line there ? i heard the tune money by the internet . first i would like to upgrade my maybank atm card to visa debit card. so i check in the internet to get information about the card. but then i found out that the tune card much better than the maybank debit card. thank’s to you. i got one more question here, if i apply on tuesday this week. when should i need to collect it. it’s on tuesday next week.Â do i need to pay anything for the procces. *i already send an e-mail to them and they promise me to reply after two day. until now they still don’t reply. lucky me i got you, thank’s again for your kindness. Just wait for seven working days.Then go to the your selected pos office.to pick it up and pay RM 3..
i thought i have to pay anything first for the procces.Â i don’t want to waste my time go to collect the card since i’m in singapore right now. thank’s again for your help. okay that’s it. no more question….hehehe…. where do u get that term? sorry langkapo i’m about to said bad thingÂ about the tune card. well, you ask me to collect the card after seven working day. then idid go to the post office. i chose the head post office of johor as i belive it might be easy. therefore you know that i’m staying in singapore right now. i don’t want to mention about the border singapore-johor. it’s not easy okay.. then, you know what, i don’t get my tune card yet as been promise by the tune company. you want to hear the funny thing that happen in the post office. the officers ask me “it’s you been waiting after seven working day, well we also waiting for our card. you only waiting for seven working day. it’s been a month we waiting for our card.”. it officers,Â that mean more than one officer. that it’s my last chance go to johor. co’z i leaving to bali soon. maybe i will not using the tune money. therefore i already make my maybank debit card. 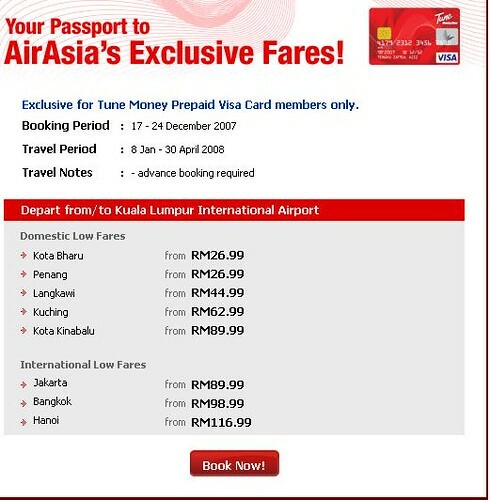 i still can use it for book my flight withÂ air asia. i’m sorry langkapo, i know it’s not your fault. i hoping the tune card company read my comment. co’z i did try to send an e-mail to them and call them, but still i didn’t get the reply and any respone. dan nama sudah ada,saya x pernah isi pun form 2.nakbuat mcmana? elo bro. U dah ada pasword dia belum? Klu blum, kat mana yg errornya? U shud know that you must let you browser allow pop up just for Tune Money. u should pick the card at your selected pos office when you register for tune card. SInce u dah dapat pin number tu, so most probably kad tu dah ada. So my advice, u call tune money center at 03-20928555. Believe me you are not the first one. :). Please call the Tune Money Customer Service. They will help you solve the problem. sy dah buat kad tp tak sampai2 lg dah nak masuk empat bulan di kl sentral.dah sampai malu byk kali pergi pej.pos kad masih tak ada.adakah saya patut ambil tindakan undang2.tarikh mohon 28/4/2008. saya nak tanya..skrang ni bole tak verified paypal menggunakan tune card? okay..tq very much.,,dah buat dah,,tinggal nak tunggu 4 digit number. ha cik lyn, tahu tak kat mana 4 digit number tu kat mana ? Saya nak bertanya macamane nak gunakan tunemoney card ini? @ mordiah – hi nice to see you here. Kad Prepaid Tune Visa card ni untuk di gunakan membuat transaction online, Online Money maker memang suka kad ni sebab boleh keluarkan duit dari PayPal. selain itu buleh di gunakan untuk membayar ketika shopping pun ble macam kad kredit biasa, kena toppup dulu je lah. cam tu lah lebih kurang ceritanya..
Assalamualaikum. nk tanya sikit, berapa bayaran yg dikenakan untuk apply debit card tunemoney? Â Saya perlu tahu kesemua kosnya ketika apply termasuklah topupnya. terima kasih. Saya dah baca FEES N CHARGES untuk apply tunecard. Semua kos di bawah RM 20.Â Mengenai nk buka akaun paypal, berapa pula kosnya? Kalau duit masuk ke akaun paypal, dari paypal nk transfer ke mana2 bank di malaysia, boleh ke? @ ADLI – Waalaikumusalam , To open your PayPal account it is free. RM 0.Just use Tune Card to verify your PayPal account. Nope, you just can transfer your money from PayPal to Tune Card, dan keluarkan melalui ATM CIMB Bank. Other card that works, Public Bank Debit Card. You can use credit card but it is not advisable since it is risky. @ zainah – hehe no problem zainah. Sharing is caring. My damia anura is 11 months now. Topup minimum tunecard rm50, tapi kalau masa saya collect card tu di pejabat pos, perlu tak saya topup masa tu atau hari lain saya boleh topup bila2 masa? salam adli – Â you can choose anytime you Iike I guess. Tapi lagi senang top up terus di situ kan. You can ask kerani pos tu lah. detail. Boleh lankapo tlg bagitau syarikat tune ni dari mana penubuhannya. Saja nk tau. Supaya kalau org tanya saya,ada jugak lah jawapannya. he!he!. Terima kasih skali lagi kerana menjawab beberapa soalan2 yg sebelum ni yg saya kemukakan. Selamat berpuasa dan selamat hari raya yg bakal tiba nanti. saya nak tanya.sampai skarg debet cad saya lum aktip,sebab kata laluan tak da,bila nak bagi kata laluan? Assalamualaikum. nk tanya sikit, berkenaan ngan paypal akaun,Â saya dah berjaya link ngan tunecard ke akaun paypal tapi step yg kedua memerlukan saya utk confirm kan. Dlm email saya paypal menyatakan saya perlu check card statement dlm 2-3 hari bekerja utk dptkan 4digit nombor. Tapi saya dah tunggu seminggu masih tk dpt email atau apa2 berita dari paypal berkenaan 4digit nombor itu. Adakah saya perlu menggunakan dulu tunecard itu? @ ADLI – Salam. ADLI, 4 digit itu akan di hantar kepada anda melalui online statement di Tune Card. So log in Tune Money, dan cek online transaction. Make sure you have balance at least RM 10. PayPal akan tolak dulu then dia akan pulang kan balik. PayPal tidak akan email 4 digit itu. dgn takdenye petunjuk tu, camne sya nak tau bile sya nak amik kad sya? adakah tunemoney akan anta surat? @ amir – Salam En Amir. Rilek. First of all, congratualtion on joining Tune Card family. Simpan resit tu untuk bukti pembayaran dan tunggu hingga 7 hari bekerja. Then, pergi ke Pos Office yang telah di pilih untuk pick up the card. Bayar Rm 3 dan log in kembali dan activate your card. @ amir – Salam En Amir. Rilek. First of all, congratulation on joining Tune Card family. Simpan resit tu untuk bukti pembayaran dan tunggu hingga 7 hari bekerja. maksudnya, pos ofis yg saya pilih masa daftar online tu ke? kalau btul, sya kene pegi ampang point, sbb dahÂ pilih pos ofis ampng point. tp bleh ke kalau kite nak tuka nak amik kat pos ofis lain? *musykil dgn akak kerani pos ofis tu, die kata pas sya baya, akan dianta 1 email kt sya,untuk bgtau bile baya. Ikut statement akak tu lagi, amik kad dlm 14 hari. Tunemoney kata 7 hari, die kata 14 hari… agak kompius..
@ amir – tak buleh tukar rasanya sbb dah submit kan. Anyway you can call Tune Money Customer Service. 03 2092 8555 and ask them. mengarut je akak tuh, hehe. Should be 7 working days. You can still call them first to verify if your card dah saiap belum after 7 days. Please remember your id,password, and three answers. If not you have to call Tune Money CS, to reset all your password. so, add yg sya bagi masa isi borang online ari tu(ampang point), konfem ek sya kene amik kat situ? @ amir – yup bro definitely. Remember to call them first after 7 days to make sure the card is already there. So you won’t waste time and money. one more thing blh tlg explain meaning of paypal? @ Didi – salam. Mudah aja. Tunggu sehingga 7 hari berkerja. Pergi ke Pejabat Pos yang telah dipilih. Kalau sudah reload online tak perlu top up di PEjabat Pos. Just bayar RM 3. Kalau belum isi borang Pos Akaun 39 untuk reload minimum RM 50.Boleh rujuk di sini, first time reload. PayPal ni secara ringkas ialah akaun antarabangsa kita. Membolehkan kita menerima pembayaran dari oversea dan membuat pembayaran ke luar negara. PayPal ni popular di kalangan mereka yang gemar membuat duit secara dalam talian (online). Nak bukak akaun di PayPal mudah dan percuma. Thanks for this forum. But i have to know about paypal. If i transfer an amount of money to paypal by 1st of December, will my paypal account updated instantly with the amount i’ve transfer, will it instantly updated on the same day. Because I’ve to buying things online on that day. Actually,i’m kind of afraid, because I subcribe and pay my Tune card on 20th of November. So after 7working day should be on 28th of November,i’m not sure will my card arrive. I’m in penang. West should be 7working days. I’ve to purchase on 1st on December with paypal only. I’m buying US stuff. If after 1st of December,i’m gone. So i need your advise. Thanks! hi sanyu – first of all, thanks for drop by. 2nd ,I am afraidÂ you wont make it to get the Tune Card and getÂ verified by paypal on time. = more than 1 week. Lets say i borrow a credit card from my uncle and attach the credit card by today, this saturday should be activated d right? Also, if I pay by paypal today, can they recieve my payment instantly on the same day? Oh, it is just a small component negative ion generator. And due to billing address and shipping address is different so i have to use paypal. The company allow me to buy one unit but the delivery area was limited to US. So since my friend is coming back from US, i deliver to his house and ask him bring back. So before he come back, i have to ship! Haha. Or else, i cant have the component anymore, Malaysia not selling it and China sells in 1000unit. I just need one. 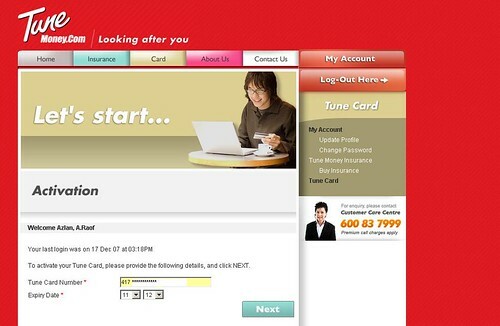 bole terangkan lebih detail tak pasal card ni..
i dah apply melalui online..
after that i nak wat apa? pas dapt card kita kene active kan eh? kad tu umpama cam card creadit ke?abiz tu macam mana kita nak tau byran balik? hye…hehehe sori slah type lah..
maksud nye kad ni macam kad atm eh? so kita dah dapat card tu kita active kan..
lepas kita kene topup eh amoun yg kita apply eh? niza- it’s ok , just gurau je. Macam kad ATM lebih kurang. But more like prepaid card, you only use the amount that you reload. I register and made my payment for Tune card on 20th November (Thurdsday). Can i get my card on 1st of December (monday) to start buying my things online? Can you calculate for me? Thanks a lot. Normally it will take 7 working days, but in some cases it might take more than that. So frankly I cannot guarantee that the card will be available Â on 1st December :). So hopefully you will get the card on 1 December. If you want to use PayPal with Tune Card, it will take another 3 – 4 days to get verify by PayPal. PayPal will send 4 digit number to your tune card account statement within 3 days. Then you need to enter the number in PayPal account to get Tune Card verified. Oh, thanks. they said a visa card will do. So i no longer need paypal. Thanks again. bro, no cvv ade ke kat blakang kad tu ? yup ada. yg kecik sebelah kotak signature, 3 nombor dlm italic. ada tak? ape tanda yg kad kita dah siap ? kalau nak call, no mane yg bole dicall guna line hp ? bila saya log in kat tune money, lam bahagian tune card tu die ade tulis, ”Â your card is still under process, please login back after collecting your card.” .. tu maknenye x siap lagi ek ? ape die akan tulis bile kad tu dah siap ? so, kalau 10 hari bekerja, bile akan sampai ek ? konfius la..
gurau jek, klu dah 10 hari bekerja, ko pergi jek kat Pos opis yang telah ko pilih.Pergi sana tanya ada tak kad ko. Tune Money will not call or email you. die ambik masa bape lame utk kad tu aktif slpas kita activate ? once activate, terus buleh pakai la. masukkan no di kad je. bro. ak dah collect kad.. tapi, xleh nak activate lagi, die masih tulis “your card is still under process” . xde pon activate..camne ni ? cuba call tanya Customer Service Tune Money. xpela bro.. dah call tunemoney, die ckp die yg activatekan card tu..
Hi there, I received the card and the code for several days before this, but I don’t have the login ID and password to pass the 1st phrase of verification. May I know where to get the ID and Pass? Thank you. How do you apply for the card in the first time ? lankapo aku ada masalah pasal tune money.aku dah apply kad pada 14 november.pada 21 nov aku gi collect cad kat pejabat pos.tapi terkejut staff pos kata perkhidmatan colect tune money kat pejabat pos telah ditamatkan bulan feb tahun ni.lagipun dah lebih 7 hari.bila aku call customer servise dia kata kad terus dihantar ke rumah.so tune money hantar pakai pos biasa ke pos laju.? dah lama dah hantar direct ke rumah. So dah settle ke skrg? Dah try Maybank Debit card dah? Klu nak guna Tune Card sebab nak cash out PayPal..you can do the easier way. Salam wbt.bro saya baru nak buat kad tune….baru nak mula buat ebay tapi susah nak daftar…eception saja nape ya dah tak leh daftar lagi ke?? ?